The first steps toward learning how to manipulate your Samsung Galaxy tablet are truly simple. Unfortunately, however, the terminology is most definitely not as simple. Minus an ample supply of buttons and knobs, your tablet is controlled for the most part by manipulating things on the touchscreen. That manipulation happens by using one or two of your fingers. It doesn’t matter which fingers you use, and feel free to experiment with other body parts as well. Double-tap: Touch the screen twice in the same location. Double-tapping can be used to zoom in on an image or a map, but it can also zoom out. Because of the double-tap’s dual nature, it is recommended using the pinch or spread operation instead when you want to zoom. Long-press: A long-press occurs when you touch part of the screen and hold down your finger. Depending on what you’re doing, a pop-up menu may appear, or the item you’re long-pressing may get “picked up” so that you can move it around. A long-press might also be referred to as touch and hold down in some documentation. Swipe: To swipe, you touch your finger on one spot and then drag it to another spot. Swipes can go up, down, left, or right; the touchscreen content moves in the direction you swipe your finger. A swipe can be fast or slow. It’s also called a flick or slide. You can’t manipulate the touchscreen while wearing gloves unless they’re gloves designed for using electronic touchscreens, such as the gloves that Batman wears. Your Galaxy tablet features a gizmo called an accelerometer. It determines in which direction the tablet is pointed or whether you’ve reoriented the device from an upright to a horizontal position, or even upside down. That way, the information on the touchscreen always appears upright, no matter how you hold it. To demonstrate how the tablet orients itself, rotate the device to the left or right. Most apps change their orientation to match however you’ve turned the tablet. The rotation feature may not work for all apps, especially games, which may present themselves in one orientation only. 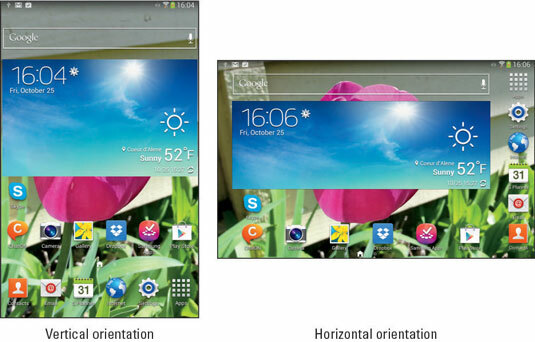 On some large-screen Galaxy tablets, the Apps icon stays in the lower-right corner when you rotate the device. You can lock the orientation if the rotating screen bothers you. A nifty application for demonstrating the accelerometer is the game Labyrinth. It can be purchased at the Google Play Store, or the free version, Labyrinth Lite, can be downloaded.